This newly opened perfume boutique is definitely worth popping into should you find yourself in Covent Garden in London. It was on my must-visit destination list while recently in town and actually stumbled upon it accidentally while taking a quick stroll outside my hotel. 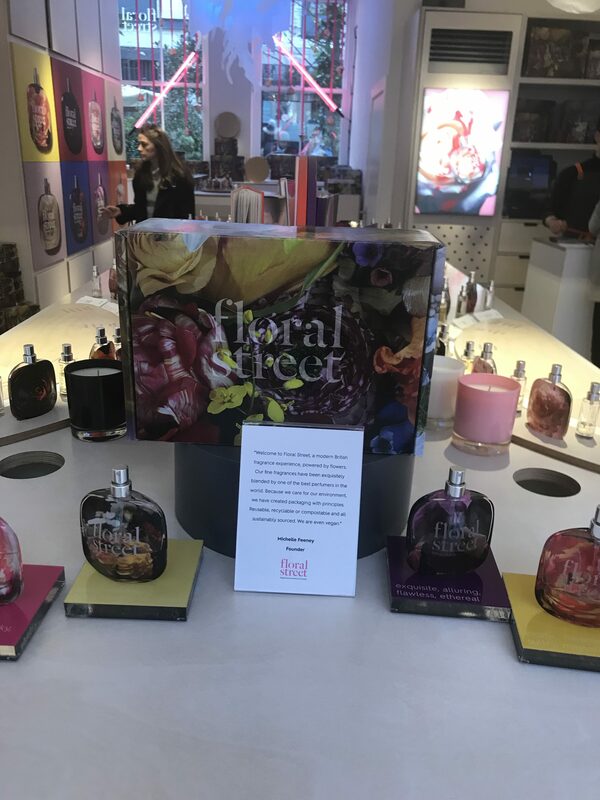 As you might expect, Floral Street specializes in floral fragrances, each designed to fit different moods. Whether you’re feeling dreamy, focused or quirky, Floral Street has a scent for that. Stepping inside the shop was like falling down a rabbit hole of powerful visuals and alluring bottles. Each of the eight perfumes seemed to be flirting for attention and I was happy to comply. The perfume bottles are beautiful and the darker the background color of the bottle, the darker the fragrance. I was given a friendly welcome by Scott, the store “Florista” (yes that’s what they are called here) who gave me the lay of the land. 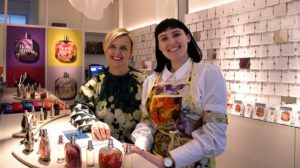 We talked about the types of scents I’m generally drawn to as well as the ones I tend to stay away from. After giving me a scentroduction of all eight their perfumes he left me to wander and explore on my own. The only one which screamed feminine floral was Neon Rose, best described as a Green floral. The others were either Citrus (London Poppy), Musky (Ylang Ylang Espresso, Iris Goddess, Chypre Sublime and Black Lotus) and Woody (Wild Vanilla Orchid and Wonderland Peony). While I enjoyed testing out all of the perfumes, the only one that I fell hard for was London Poppy. I ended up purchasing a travel size bottle and will consider buying a full bottle once I run out. 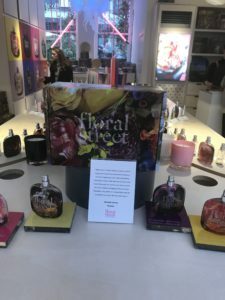 Floral Street carries a diverse line of fragrances and has something for (almost) everyone. I agreed with their scent mood/personality descriptions except for Neon Rose. Available for purchase are a discovery set which includes all 8 fragrances (£17), 10 ml bottles (£38) and 50 ml bottles (£55). Some of their scents are also sold as body lotions and candles. Shipping is an additional £28 on the Floral Street website which is steep unless you plan on buying a lot of bottles. I’m hoping they’ll become available for sale in the US sometime soon. The perfumes in this collection were created by star perfumer Jerome Epinette who is known for his mastery of natural ingredients. Each scent was created using prized raw materials sourced by the iconic fragrance house Robertet. Oh, how I wish we could somehow make it possible to smell things through the internet. I can’t believe it, you’ve had this site going since 2016? It’s a wonderful place, and you’re descriptions make me want to smell these fragrances badly! I don’t know if I’ll be in London anytime soon, but I absolutely love the fact that I can get an 8 pack of samples of these fragrances. That’s such a great idea! Scent discovery sets have become increasingly popular. It’s a great way to explore the range of different perfumes a company makes without having to commit to a full bottle. I don’t know where you are but I’ve heard that Floral Street will be opening a store in New York sometime soon. That’ll great for those offs in the US since we won’t have to pay the ridiculous international shipping fee.